Trinity School of Medicine is an opportunity, not just for its medical students, but for the US and Canada. By educating future physicians in the science of medicine while nurturing their caring instincts, we achieve our goal of improving access to quality healthcare. Our approach to education is designed around the success of our students, in school and as physicians. We heavily integrate clinical experience from day one of the basic science terms at our affiliated teaching hospital. We offer small class sizes (25, not 250), with experienced and supportive faculty, and we always, always focus on patient-centric medicine. 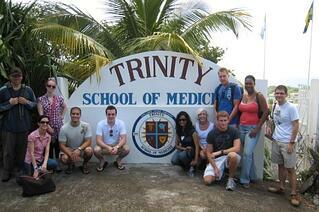 Trinity School of Medicine is the flagship program of Trinity Medical Sciences University. TMSU is the natural outgrowth of Trinity's thriving medical program, extending the original spirit of excellence through opportunity into undergraduate and graduate degrees in health sciences. There are a lot of reasons to attend Trinity School of Medicine. We take every opportunity to grow and evolve our proven methods for medical school success through early clinical experience, integrated USMLE preparation, and an ongoing culture of support. As an accredited medical school, our outcomes speak for themselves.We’re one of the highest ranked Caribbean medical schools with an ever-growing list of approvals and recognition, a strong residency match rate (including many competitive, prestigious institutions around the US and Canada), and high student satisfaction. Our mission at Trinity is simple: educate physicians to meet all health care needs of patients within both current and future health care systems. Through teaching, community service, and research, we strive to develop future physicians to their full potential with the vision of improving access to quality health care and enhancing the health status of residents in the communities they serve. Trinity's campus sits high on a hillside in the Ratho Mill district of Kingstown, the capital of St. Vincent and the Grenadines. Like any school in a temperate climate, there aren't many hallways, just sunshine and sidewalks between anatomy labs, the library, classrooms, and student housing. Situated in the eastern Caribbean, the tropical landscape of the island is lush, bright, and consistent—the perfect atmosphere for the rigors of medical school.